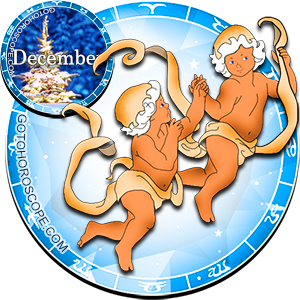 December 2015 Horoscope Gemini, free Monthly Horoscope for December 2015 and Gemini Astrology Forecast for the month ahead. The sign of Gemini, in which the Air element gets its formation, can count on a fairly positive coincidence in December 2015 that will be mostly determined by the position of Saturn, traditionally responsible for the blossoming of the vitality of the representatives of this sign. Saturn will be repeatedly reinforced by his interstellar position, so the Gemini will have enough resources to face any problem head-on and get out of the situation as the clear winner. At the same time, Mercury, the planet-ruler of the sign of Gemini will not be able to maintain his current status and will change the modality of his own energy flows. Such blatant betrayal could well be the reason for the emergence of a whole series of problems, especially as Jupiter (responsible for the expulsion of the sign of Gemini) is likely to join the Mercury. Fortunately, Venus is responsible for the fall of Gemini, but due to her rather unique position will shield her own energy flows from the Gemini, so you do not have to expect any surprises. In terms of the working direction, we can say with certainty that in December 2015 the fortune is not on the side of Gemini. However, it is not necessary to believe that you have to go through a purely negative life stage without any good. On the contrary, at the end of the year you will be introduced to many opportunities to improve your financial position, and perhaps you will be able to get a new position. However, you should not rely on blind luck, now the circumstances are clearly not emerging in your favor. That is, in any case you cannot participate in any adventures associated with money. There is an almost one hundred percent probability that you will lose what you decided to invest in such activities. You should be especially wary of important agreements and contracts - be doubly careful. It is unlikely that you will be cheated, but a silly accident can easily cause serious problems in the future. This is especially true for those who have their own businesses. Move in a predetermined direction, do not grab the stars from the sky, but surely work on forging your own destiny, then at the end of the month you are sure to come to the result you deserve. The sphere of feelings and emotions will not bring the zodiac sign Gemini any serious problems in December 2015, especially when you consider that Venus will completely block her own negative impact and her energy will be neutral. It is definitely possible to say one thing: you have all the chances to achieve your goals, as they say, in full. The main thing is not to doubt your abilities under any circumstances. If you know that you can - then do it. And no matter what others say, because it is your life, it is only built by you, by your actions and equally by your inactions (which at times can also take quite a dynamic form). In relations with those close to you be open and fair, but even they do not get to preach some unbelievable ideas that plunge you into confusion. What is most important to you is certainty and a clear understanding of what is happening. Look for support in your lover, your relationship will be harmonious, warm and trusting. Of course, those who do not have a lover have it considerably harder. But there is nothing to be done about it. The choice of accomplishment usually defines a long chain of events for years to come, such that people sometimes cannot see the end of this chain.